Same-day repair of refrigerators, coolers and freezers. Convenient scheduling online and by text message. Plus, FREE house-call with your repair. 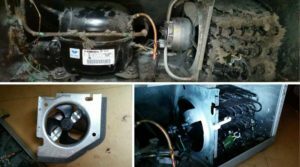 Refrigerators that are not performing as usual or are having issues need an experienced licensed technician to diagnose the problem and repair the problem. FIX Appliances CA technicians are experienced in troubleshooting and repairing refrigerators. We service and repair all house-hold refrigerators, including built-in and stand-alone. With no extra charge appointments available 24 hours a day, 7 days a week, our skilled technicians are just a call away. Our team members are licensed and insured to handle all your refrigerator repairs in Barrie, Simcoe county, Toronto and GTA quickly. Convenient scheduling options are also available online and by text message. There’s no bigger emergency than when your refrigerator stops working. 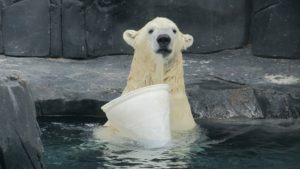 It’s not only an inconvenience, spoiled food can also make it a big expense. At FIX Appliances CA, we’ll schedule an appointment the same day you call to help reduce your loss and get you back to normal. Your house call is free if you order repair work. Call, text or schedule an appointment today. Save $20 on Refrigerator Repair For new customers only, for refrigerator repair. Our 7 year old Whirlpool fridge would not defrost anymore and was icing up on a regular basis. I had a pleasant conversation with the agent that answered my call for service and was provided an appointment time the next day between 11 and 1. Oleg arrived at 10:30(early is much better then late!). He was very polite and knowledgeable and explained to me in detail what he suspected the issue to be, how he would test the items first to confirm what needed replacing(defrost timer,defrost heater assembly) and clearly advised me of what the cost would be. He had the parts needed with him and with my go ahead was able to repair our fridge within the hour explaining to me what he was doing and showing me what he was doing all along which I appreciated.. As it turned out it needed a new control board which was the most expensive part, but his price was more then reasonable and lower then what we were expecting! Our fridge is now working A1 again for which we are thankful. I would not hesitate in recommending this company to friends or family and would also reach out to them if we ever have any issues in the future. Thank you Oleg...you were great! 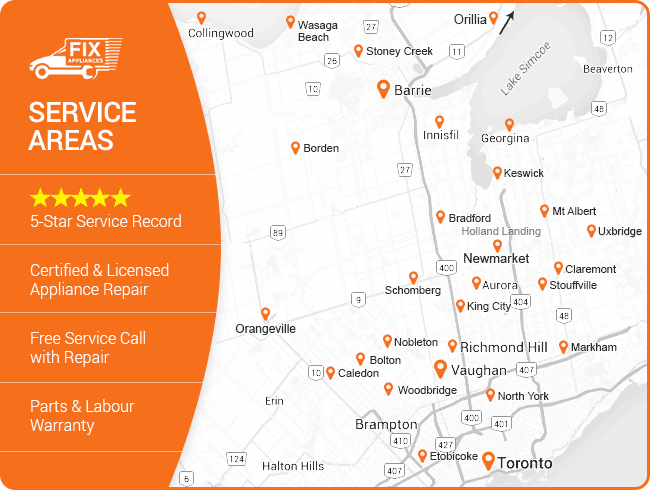 FIX Appliances CA is located in Barrie and Bradford, Ontario, and our local refrigerator repair technicians cover Simcoe County, Toronto and GTA areas. Check the map to confirm the service area nearest to your city or town. Each service truck carries a full inventory of common replacement parts so your refrigerator repair can be completed the same day. Samsung, Whirlpool, Maytag, Amana, Frigidaire, KitchenAid, Kenmore, and more brand name fridges. Will a refrigerator work in my garage? Yes, but it’s risky during cold seasons when the temperature drops below 10 degrees Celsius (50 degrees Fahrenheit.) Frigid temperatures can cause the compressor oil to thicken and stop working. Why does my refrigerator run so often? This can be caused from dirty condenser coils, inadequate air flow from the appliance being too close to the wall, or the door is not sealing properly. What’s the proper method to dispose of my old refrigerator? Environmental and safety laws make it illegal to dispose of a refrigerator that still has refrigerant in it. Contact a licensed professional or appliance repair service to properly dispose of the unit. What’s the typical lifespan of a refrigerator? With proper maintenance, a refrigerator can be expected to last 14 to 17 years. Large, radiator-type coils are located at the back or bottom of your refrigerator. They remove heat from the appliance but are less efficient when dust and dirt accumulate on them. Vacuum them off twice a year. Wipe down the gaskets around the refrigerator and freezer doors to keep them sealing tightly. Replace loose or torn door seals to save energy and keep your food cold. Use an all-purpose cleaner to remove crumbs and spills on inside shelves and walls. Special cleaning wipes are available to safely remove fingerprints from exterior stainless-steel doors and handles. To keep your refrigerator smelling fresh, place a specially designed refrigerator deodorizer inside the unit. It will eliminate food odors for up to six months. To keep ice cubes and water tasting fresh, replace the ice maker and water dispenser filters every six months.